Merrick, New York, USA. January 23, 2016. Travel is strictly for the birds, when Blizzard Jonas brings dangerous snow and gusting winds to Long Island, and Governor Cuomo bans travel, shutting down L.I. 's roads and railroads, due to hazardous conditions. 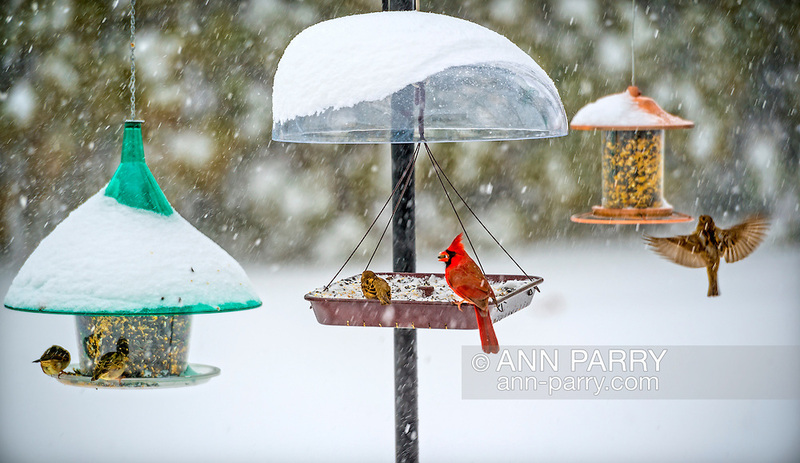 A red male cardinal and several wrens eat seeds from a variety of hanging bird feeders in a suburban backyard, as the winter Storm of 2016 already dropped over a foot of snow on the south shore town of Merrick, with much more snow expected throughout Saturday and early Sunday.